Bollard totally retractable. Two locking positions. 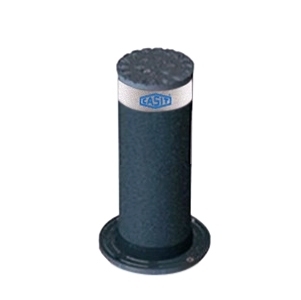 The bollard, has the function to limit the access to pedestrian zones or to small perimeters. It has the same resistance as the one developed from the impact with a vehicle and it is easily and quickly extractable from the foundation plinth. A locking device and gas spring to open the bollard. A system quarterdeck in hot galvanized coating. The standard installation foresees a dig, proportional to the force that the bollard has to stand, in which drowning the system quarterdeck in a concrete plinth. The dimension of the concrete plinth must be studied to let the bollard resist to the required impact force. A retro reflective stickers with high bright response, that allows the visibility of the dissuader in the night hours.